This is another post of a forgotten project from when I was a part of a study group on Inlay last year. While technically Clasped Weft isn’t Inlay you can use it to get a look very similar to Inlay without all the problems. 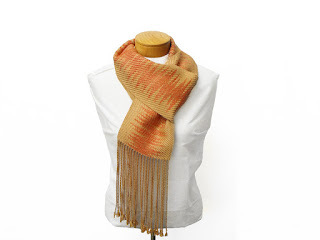 The scarf warp is 2/8 Tencel in Straw and I choose a simple undulating twill for the pattern. Clasped Weft is usually done with plain weave but I wanted a more interesting design; but it had still had to be simple. I used two end feed shuttles that had 2/8 Tencel in Straw and a small bobbin with thick and thin hand dyed Silk in various shades of oranges and golds. The centre panel of the scarf is the orange silk that is clasped to each side of the scarf. I gently pulled the warp threads apart to place the silk bobbin inside of the shed. I would then pull the bobbin to the right side and then back to the left while unraveling thread to create a loop. Leaving the bobbin on the left side of the warp. Then with the shuttle from the right side throw the shuttle to the left side, then clasp the silk and throw the shuttle back to the right side. Be careful to miss the floating selvedge on the left side but use the one on the right. With the clasped silk thread you can manipulate it to where you want each particular pick to lay. Set the pick with a gentle tap of the beater. That is only half of the pick done, now move silk bobbin back through the shed to the right side creating a second loop. Use the shuttle from the left hand side and capture the silk loop. And pull the clasped weft into position on the left side. Set the pick with a gentle tap of the beater. Last step is to remove the silk bobbin from the web. Then you can change to the next treadle and start everything again. If that seems like a lot of steps and time, well it was! It took me about an hour to do one inch! Near the end of the scarf I was able to go a bit faster and do two inches per hour. Tedious doesn't even begin to express it! I didn’t have a plan on where I wanted to have the orange silk, but I did have a couple of rules that I followed. I didn’t go past one inch from the edges and I used the strong pattern changes to help hide to clasped weft loops. The twill pattern became a texture because each pick was a double thread pick. The texture is still part of the scarf even after washing and steam pressing the scarf. 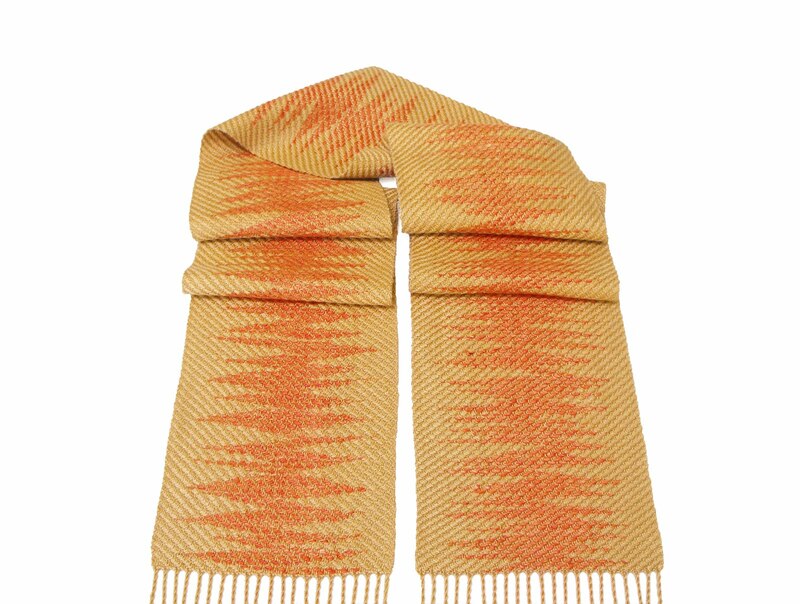 The scarf is incredibly graphic and it really showcases the variegated orange silk beautifully. But it is a very time consuming scarf so I don’t see doing another one ever again! For Sale. Final Garden Shot is the Fothergilla in bloom, it has loads of sweetly scented bottlebrush blooms. Yes, clasped weft, especially when it's clasped on both sides as you did here, is very time consuming, but the finished scarf is lovely! I'm not sure which pics have more accurate color, the ones while you're weaving or the finished ones, but I particularly love the happy, glowing colors of the finished piece.